In general, rhododendrons require little pruning. In fact, the American Rhododendron Society recommends trimming the bush to control its size, if you want to pick the flowers for an arrangement or to remove spent blooms through the season. But if your rhododendron has become leggy with age, prune it in winter to rejuvenate it. This plant's stems are covered with dormant buds that spring to life when the wood is cut. This feature facilitates a quick recovery and gives you an invigorated shrub that could pass for new. Locate the shrub's primary stems, which are the trunks that sprout from the base of the plant and the wood you'll be pruning. Look for the latent buds on your rhododendron's primary stems. They look like small pink dots. You'll see them in groups and as single spots. Make your pruning cuts above clusters whenever possible. Position your shears ¼ inch above the buds and cut the wood at a 45-degree angle. Cut the primary stems back to about 2 feet above the soil line. Prune each of the trunks slightly shorter or taller than the others so they all have different lengths. This preserves the rhododendron's natural look. You might need lopping shears or a saw depending on how thick the wood has become at that level. Azaleas have five to six stamens in their flowers. Evergreen azalea flower colors range from purple to red and deciduous azalea flower colors range from white to pink and yellow to red. 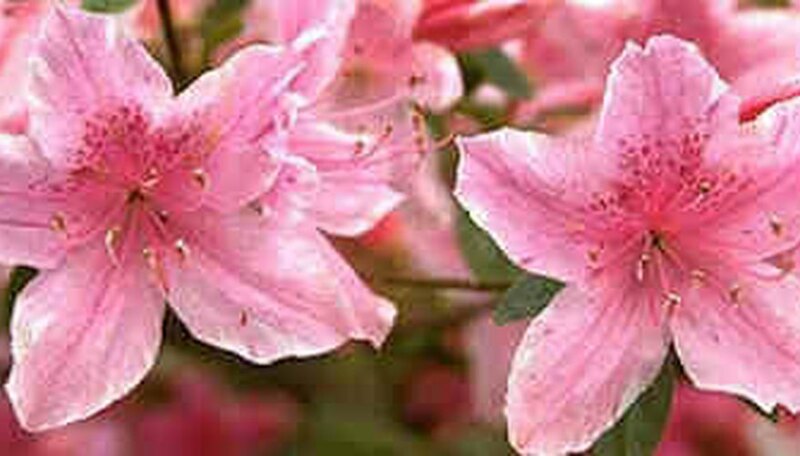 Azaleas grow well in moderate climates with well drained, slightly acidic soil. They need to be well watered. Depending on the exact variety, they bloom from March until August. Mulching with pine bark mulch will help protect roots during the winter and keep the soil the moist. The optimal time to prune is just after azaleas have bloomed to prevent cutting off next year's blooms. Azaleas need at least 4 hours per day of direct sunlight; place pots in a sunny window. Water azaleas frequently. Indoor plants will need to be fertilized every two weeks after they have bloomed. Both indoor and outdoor plants are prone to fungal infections. Light spraying with a fungicide will help prevent infection. Caterpillars and weevils can be controlled with pesticide. Winter burn causes rhododendron leaves to turn brown and eventually fall off. Frozen soil keeps roots from absorbing water and cold winds that dry leaves. Winter burn can be prevented by planting your rhododendron in mulch and making sure it has plenty of water before the winter sets in. Root rot is a disease caused by fungi such as pythlum and botryosphaeria, both of which result in root decay in rhododendrons. One major symptom of root rot is browning leaves that eventually fall off. To prevent root rot, make sure your rhododendron is planted in well-drained soil. Rhododendron leaf spot is a disease that produces small to large brown spots on rhododendron leaves. The spots grow into each other and make the whole leaf appear brown. Leaf spot can be caused by a number of reasons, including chemical burns, fungi and viral infections. Treatment depends on the ailment. Put on a pair of gardening gloves. Rhododendron leaves contain a toxic coating, and many rhododendron varieties contain a sticky coating that will quickly cover your hands as you work with the shrub. Remove each faded rhododendron blossom from the shrub promptly upon wilting. Clip the blossoms from the stems with the pruning shears just above the point where a cluster of leaves grows beneath the blossom. Collect the blossoms in the basket as you remove them. Dump the blossoms into a compost bin or in the garbage. Do not allow the blossoms to litter the soil around the rhododendron shrub because the blossoms may precipitate fungal infections in the shrub. Prune all dead branches and twigs from the P.J.M. rhododendron. 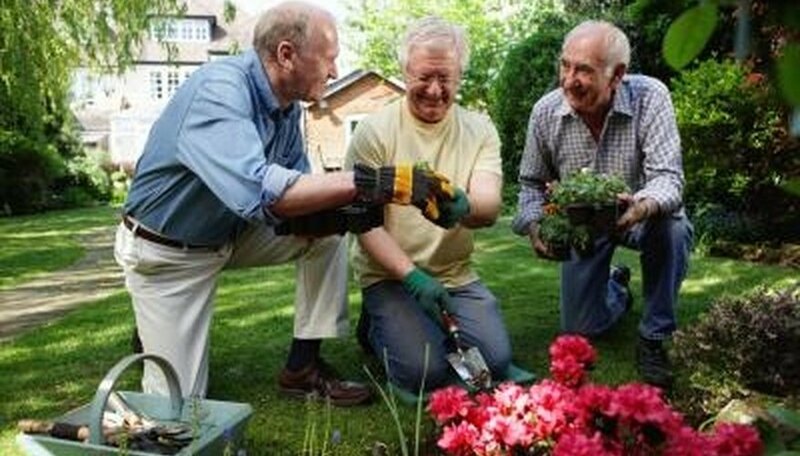 Remove all dead flowers with the pruning shears. Cut the stems back to within 1/2 inch of new growth. If there are no buds on the stem, completely remove it back to its point of origin. Remove any diseased shoots last by cutting them back to a main branch. Don’t drop the diseased foliage onto the soil, but bag and dispose of it immediately. Soak your pruning shears in a solution of 1/4 cup of Lysol disinfectant and 2 cups of water. Do not use bleach or alcohol because these materials cause rust on gardening tools. One of the most common rhododendron disease is rhododendron wilt, also called Phytophthora root rot (Phytophthora cinnamomi). Other common rhododendron diseases include petal blight (Ovulinia azaleae) and powdery mildew. 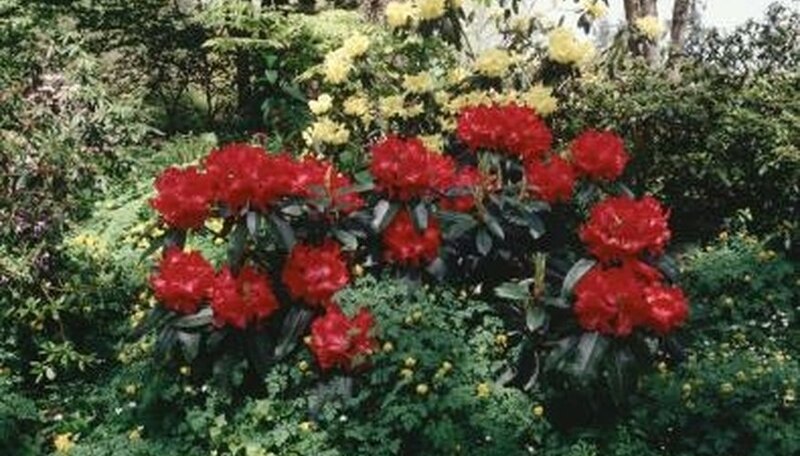 Rhododendron wilt effects include yellowing leaves, drooping foliage and stunted growth. Petal blight causes tiny rust- or white-colored spots to appear on the petals, while powdery mildew creates a white or gray coating on the leaves. Most rhododendron diseases are caused by fungal or bacterial pathogens. Many common rhododendron diseases occur during wet weather conditions in the late spring and early summer months. Rhododendron plants often suffer from iron deficiency, which causes the leaves to yellow between the veins. Rhododendrons are vulnerable to several pests, including the lace bug, root weevils and black vine weevils. Rhododendrons should be planted in high locations that offer excellent soil drainage. Dying and dead foliage should be removed from the vicinity of other plants to avoid spreading the disease. Plant your wild rhododendron in a shady area with acidic soil ranging between 5.2 and 6.2, according to rosebay.org. A soil that is too alkaline will stunt or kill your plant. Water weekly during your rhododendron's "establishment period," according to the University of Maine Extension. That period is equal to one year for each inch of your plant's trunk diameter. After that, you need only water during a severe drought. Fertilize your shrub only if a test indicates your soil's pH is not in the correct range. Amend your soil by adding sulfur. Do not add nitrogen fertilizer at planting or during the first growing season, according to the University of Maine Extension. Place mulch 2 to 4 inches deep around your shrub out to its dripline. Use pine needles or pine bark, which will increase the soil's acidity. Keep the mulch away from the shrub's trunk. Curled, browned leaves are the result of sun scorch or wind damage. The appearance of brown, wilted leaves and stems is most likely "stem die back." Stem die back affects only one portion of the plant, while remaining leaves and stems are healthy. Sun scorch occurs in the winter and is caused by harsh winter sunlight and cold temperatures, combined with inadequate watering. Heavy winds also cause brown leaves. Stem die back is caused by two fungi, Phytophthora and Botryosphaeria, according to the Ohio State University Extension. Sun scorch can be prevented by providing late season irrigation before heavy frosts occur. Additionally, planting rhododendrons near buildings or evergreen trees provides shelter from wind, harsh sun and cold temperatures. Rhododendrons are more vulnerable to stem die back when they've experienced water stress. While rhododendrons don't tolerate waterlogged soils, they need evenly moist soil. Allowing them to dry out makes them more prone to disease. Curled leaves are the first sign that rhododendrons aren't getting enough water. Infected stems and leaves of rhododendron are cut back and discarded, disinfecting the pruning tools between cuts. Additionally, plants with stem die back can be treated with a fungicide. Rhododendrons prefer mild, moist climates. They must have acidic soil with a pH range of 5.0 to 5.5. These shrubs need plenty of water and some protection from extreme weather. Wait until nightfall, then lay a white towel or sheet under the base of the plant, wrapping the trunk. Gently shake the rhododendron. Watch as the weevils fall off the plant and onto your towel. Weevils, which are gray or blackish brown in color, are about 1/4- to 1/2-inch long and have a short broad snout with antennae attached. When you stop seeing weevils fall, quickly submerge the towel in the soapy water and leave it underwater to drown the bugs. Wrap the base of the rhododendron in clear plastic wrap. Coat the plastic in a layer of sticky insect barrier. The sticky barrier traps the weevils as they try to climb up the trunk of the shrub. Remove the plastic wrap once every three days and replace it with new sticky barrier. Rhododendrons flower from early spring to late summer, depending on the variety. 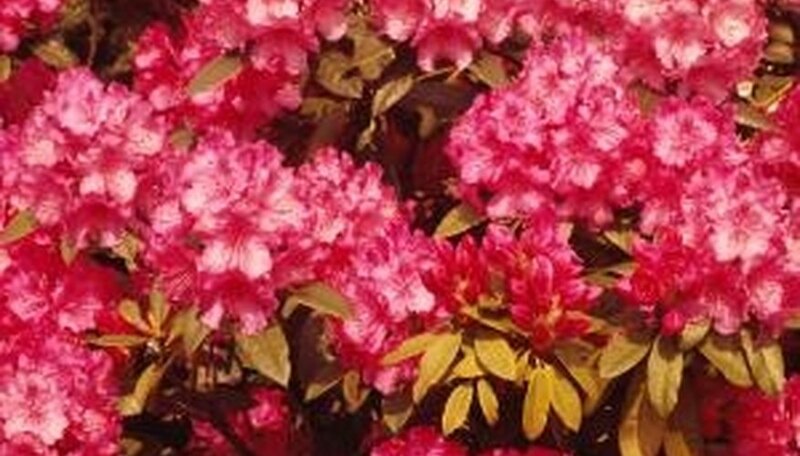 Common varieties include Pacific rhododendron, western azalea, Cascade azalea, dwarf azalea and rhodora. Azaleas are one of the most popular landscape shrubs grown in zones seven to nine. Growers look forward to the showy burst of blooms in early spring, and the shrub itself, with its dark green leaves, looks great all summer. Azaleas are members of the Rhododendron family. In common usage, the term "rhododendron" refers to the plants with larger, leathery leaves while "azalea" refers to those with smaller, thinner leaves. The care and requirements are the same for both plants. 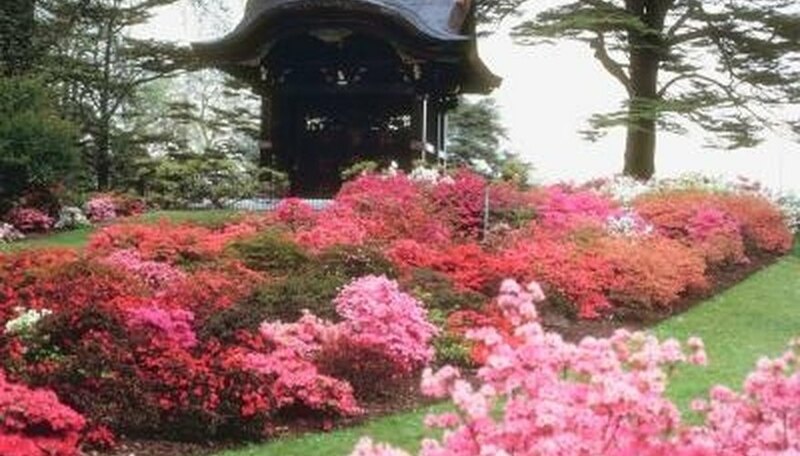 Hundreds of varieties of rhododendrons are available, and choosing varieties that suit the environment is a primary concern. Trying to grow a poorly adapted variety will result in poor results. For help in choosing a variety that is right for your location, visit a local nursery or contact your agricultural extension service. Balled-and-burlapped Take extra care when planting balled-and-burlapped rhododendrons as they are more susceptible to transplant shock. Container-grown Container grown plants are sometimes rootbound, with a mass of roots on the outside of the soil ball. If you note this when removing the plant from the container, make four or five ¼-inch deep cuts from the top to the bottom of the soil mass with a sharp knife. Space the cuts evenly. This will encourage root growth outside the root ball and allow better water penetration. Choose plants that are sturdy and well-branched. Weak, spindling plants may indicate a poor root system. The best size for planting is 16 to 18 inches. Smaller plants are easily injured by harsh winter weather. Break off flower stems as soon as the flowers wilt, before the seeds develop. Remove dead flowers, leaving the young buds at the base of the cluster. This process, called deadheading, encourages flowering next year. Prune the rhododendron bush in the summer as soon as possible after flowering is complete. Trim the bush to shape it and control the size. Pruning too late in the season can result in a decrease in flowers next year. Pinch away the terminal leaf buds on the end of new growth to encourage the development of side branches and the formation of a more compact bush. This is known as dis-budding and should be done on new growth and again in the fall. Remove damaged branches and dead wood as soon as possible. Cart away trimmings and pruned branches. Leaving debris in the area can encourage pests and disease. Cut back overgrown and out of control rhododendron shrubs severely. Rhododendrons can be rejuvenated by pruning away up to two-thirds of the plant. Choose a spot in your yard that suits the Monrovia rhododendrons’ needs. Most rhododendron prefer partial sun, all need rich, well-drained soil. Improve your soil by adding compost or manure to it, 4 inches per square foot. Work the compost or manure into the soil to a depth of 5 inches. Plant the Monrovia rhododendron in the spring after the last frost. This will give the plant time to adjust and establish itself. Dig a hole 2 to 3 inches shallower than the container the Monrovia rhododendron came in and two to three times as wide. Water until the soil is moist. Mulch over the soil with pine needles or wood chips to keep the soil moist and prevent weeds from growing around the Monrovia rhododendron. Pluck any flowers or flower buds off of the rhododendron. This will give the plant time to root itself. Deadhead the spent flowers immediately after they fade on all rhododendrons and on evergreen azaleas. Break off the dead flower cluster with your fingers at the lower end of the cluster stem, leaving the nascent flower buds at the base of the cluster stem for future growth. Repeat this process as needed during the flowering period until all spent flowers have been removed. Reduce the size or spread of the shrubs somewhat with light pruning of the terminal branch tips just 1/4-inch above a healthy whorl of leaves. Do this type of trimming immediately after the bloom cycle has finished. Induce a more compact and dense growth form in the shrubs by pinching back the tender new shoots in the later spring and very early summer. Use your thumb, index and middle finger in a pincher motion to snap off the new growth above a whorl of leaves. Prune away any broken or diseased branches when you spot them. Take the branch in question back to a point of healthy tissue just above a healthy lateral or leaf whorl. Alternatively, if necessary take the branch down to the trunk just outside the slightly swollen branch collar. Spread 2 or 3 inches of mulch under the rhododendrons; use pine bark, wood chips, leaf mold or pine needles. Extend the mulch under even the widest branches, called the drip line. Do not mulch directly next to the stem; leave a 2-inch space. Water your rhododendrons only after the soil dries. Begin watering in the spring when new growth appears. When the leaves roll up, it is an indication they need an inch or so of water. During hot summer days, wilting is normal in the afternoon and does not necessarily indicate the bushes need water. Water your rhododendrons less, if at all, during the fall. Keeping the bushes dry in early fall will help them prepare for winter. Water them one more time, however, right after the first killing frost. During the growing season, water newly planted or transplanted rhododendrons for the first month so that the soil is evenly moist. Transplanting rhododendrons in the winter is best since they are dormant.